We recently decided to convert our raised vegetable beds into a large herb garden. A herb is any plant whose leaves, seeds, or flowers are useful for flavouring, food, medicine, fragrance or other useful applications. We have six raised beds available for our herb garden. We have already planted three, while two are still covered with plastic until we are ready to plant them. Earlier this week we made a start on the one the kids, and I are most excited about. – Our fairy herb garden. Our fairy herb garden will house all the beautiful miniature herbs that would get lost in our other beds. It will also be home to some of the fairy craft projects that we make. 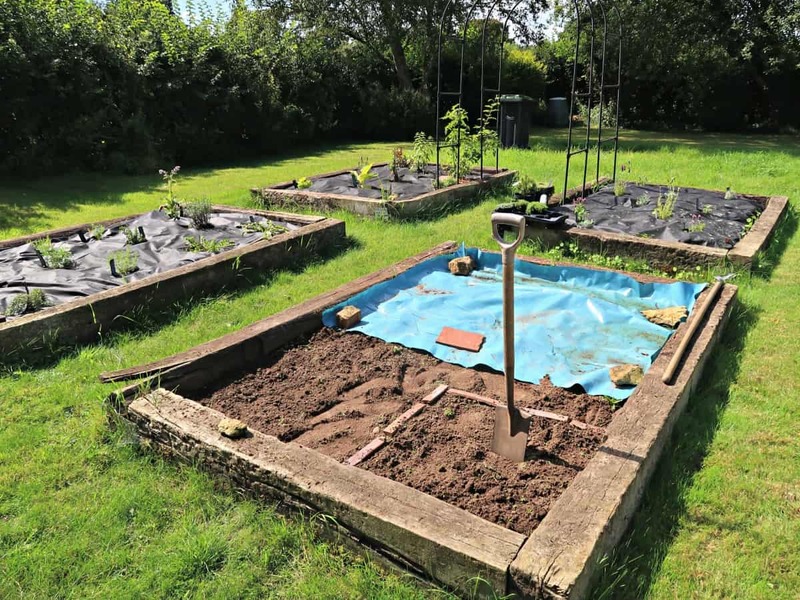 To make the build manageable, we plan to build and plant it in sections. And as with any garden, we needed to start with the hard-landscaping first. 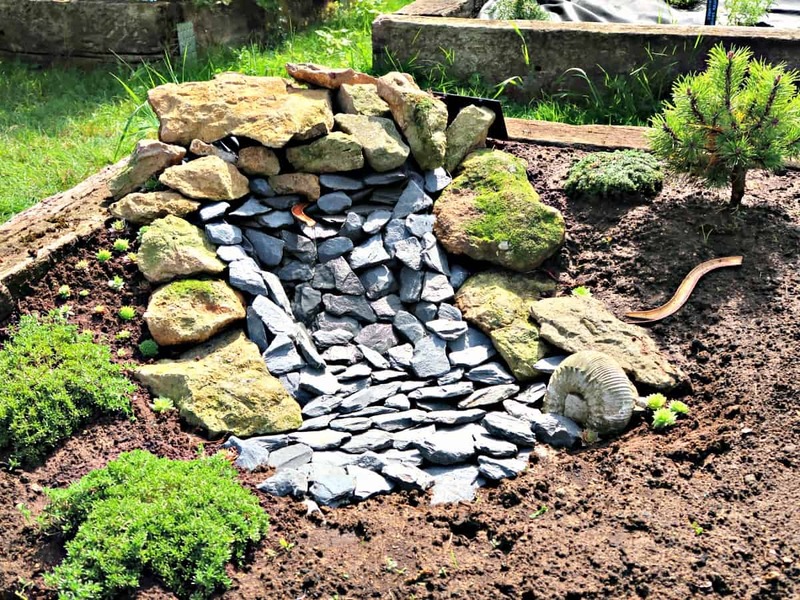 When I talked to the kids about they wanted in the garden, a fairy waterfall was the top of the list. 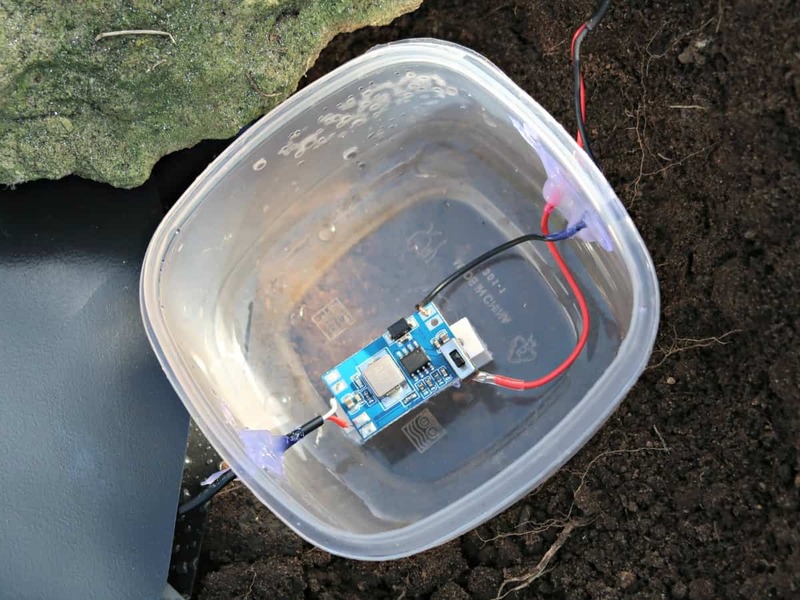 We didn’t have the budget or inclination to spend lots of money on garden features, so enlisted the help of my brother who is brilliant at doing electronic projects with the kids and he helped us put together the solar powered pump. The total cost of parts was around £5. You simply solder the solar panel to one end of the chip and the pump to the other. We housed the chip in a small plastic box and used lots of hot glue around the entry exit holes to make it watertight. 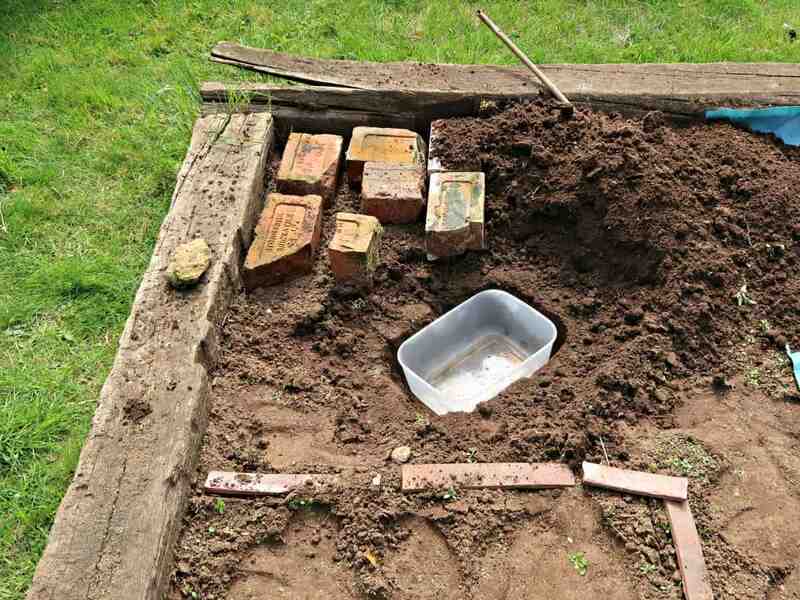 It would be fine to bury the box under the soil although we hid ours under a rock. We also put plenty of hot glue over the soldered connection to the solar panel to make it watertight. 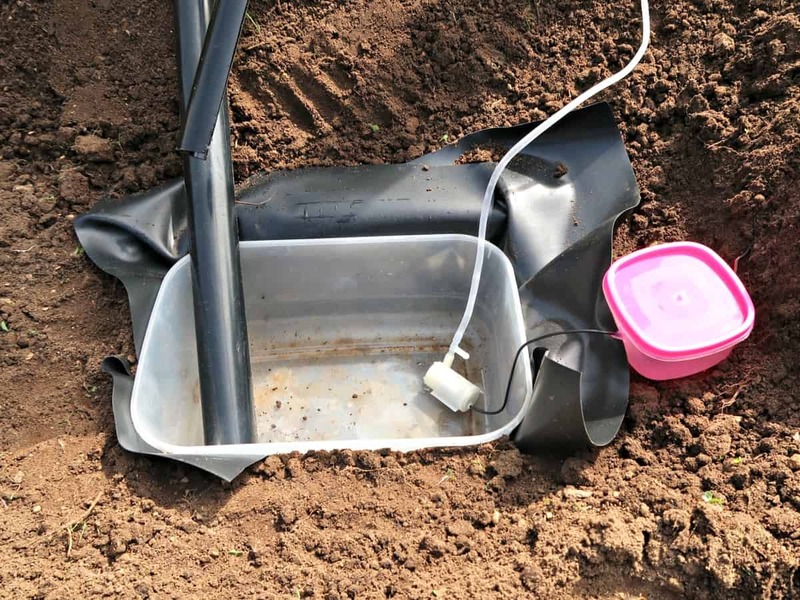 There are also various fish tank & pond kits available which could be easily modified to do the job from as little as £20, but as we already had all the parts (and his knowledge), we made it ourselves. We found most the materials used in the structure of our waterfall in our garden. 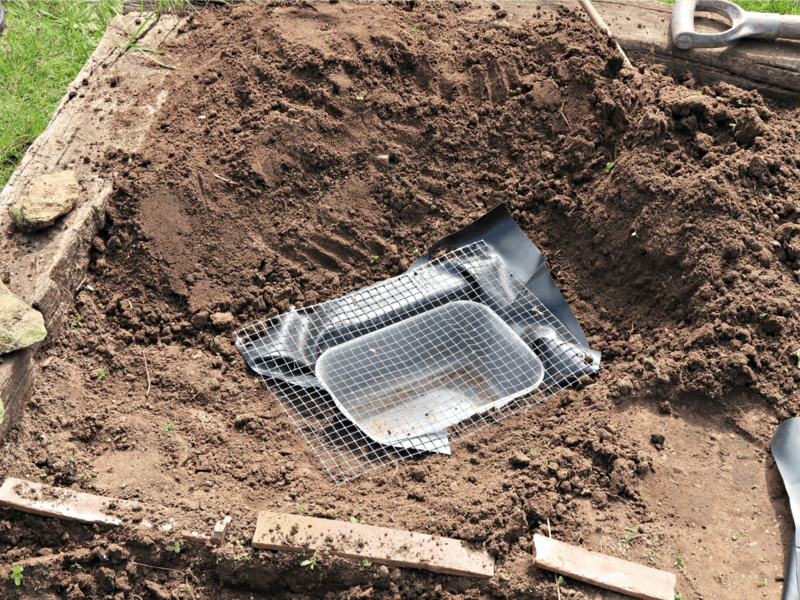 One exception was the pond liner offcut which we found at the garden centre, and got for a pound. We started with a few pieces of brick to give our mound some stability. Then simply used soil dug out of another section of the bed and our water reservoir to create our slope. To make sure we didn’t lose too much water, we used the pond-liner strip and two half pipes to make sure it all channelled back to the reservoir. We also used one of the pipes to protect our plastic tube carrying our water from the pump. 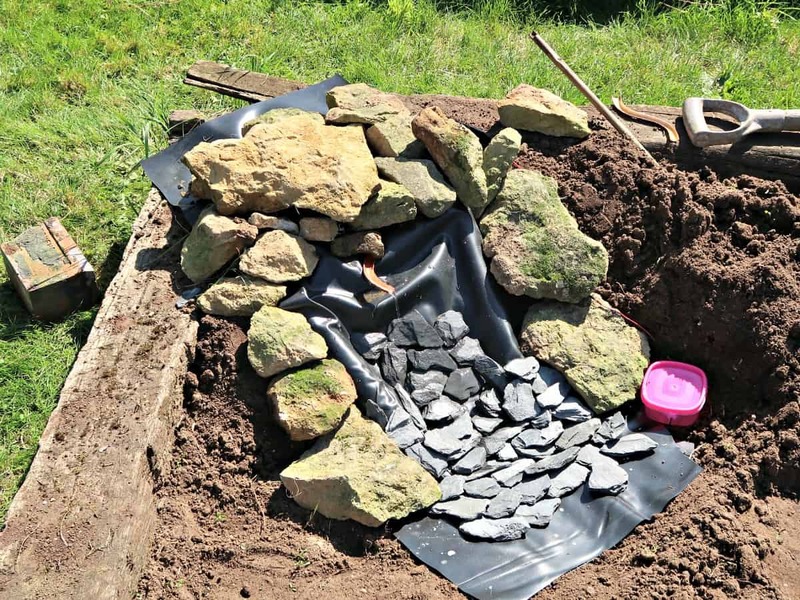 The video below shows everything working before we added our rocks. 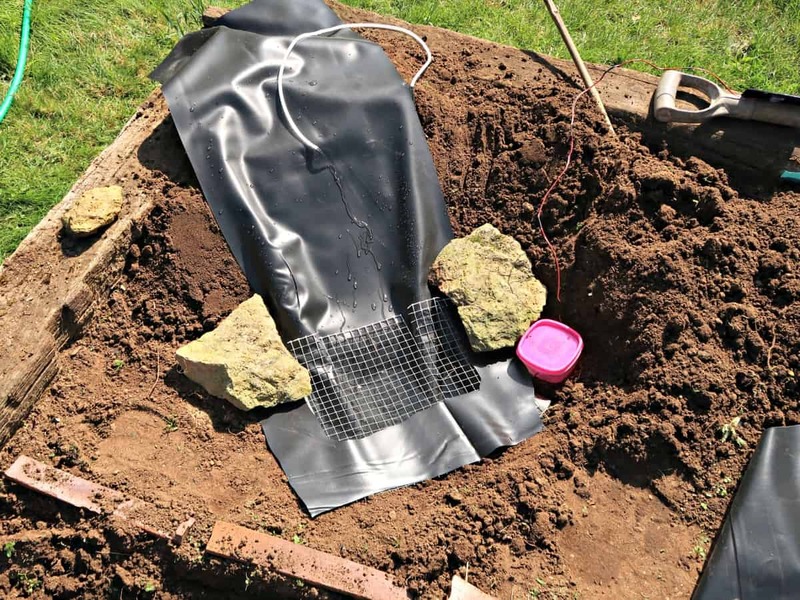 Once everything was in place, we surrounded our reservoir with strips of pond liner to discourage soil washing into the water (and potentially clogging up the pump) and covered it all with a piece of mesh to give further protection and to hold our slate. The tube carrying our water to the top of the waterfall runs into a little indent that we made at the head of the liner. We used a small piece of bent copper pipe to carry the water out. We used a combination of stone and slate to get the look we wanted and started planting some herbs. This project is working progress, and we’ll be adding more plants and embellishments as we go along! For more Fairy Garden inspiration check out our gorgeous miniature acorn cap LED lights and our Gourd Fairy House. This is just wonderful, you have great ideas and follow thru with them! Great role model for the children. Does your brother have a store or website where he gets the solar parts? Can he recommend a book for learning this sort of thing? This is so cool Sarah, and is going to be so cute when all done. I didn’t know that you could make a solar waterfall. Love it! 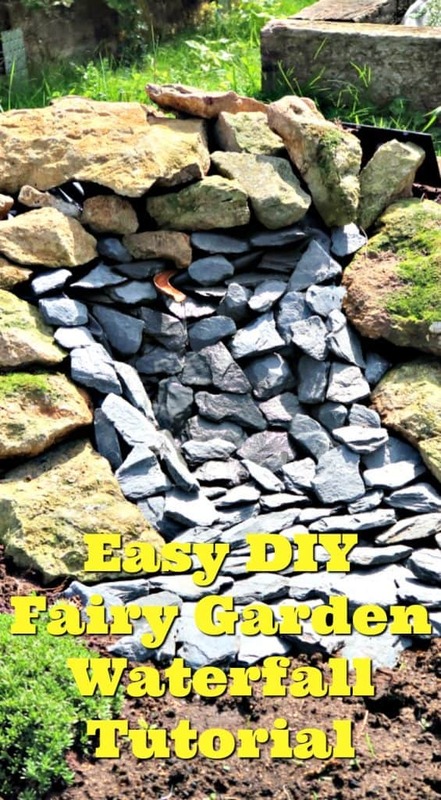 We’re having such fun coming up with ideas for our fairy garden Linda, it’s become my new obsession! This is so cool Sarah, and is going to be so cute! Can’t wait till you get it finished. I did not know that you could run and pump by solar. I have been wanting a small pond with a fountain for the wildlife around, and frogs so maybe they will stay out of the pool. But there’s not any electricity where I want it, and I didn’t want to string out a electical cord. This is something to think about. I’ll have to see if I can talk the hubby into it. Thanks, Michelle. It’s so interesting that you can’t get them easily over there – if you ever want one let me know and I’ll send one over from here! I absolutely love the idea of a fairy herb garden! How fun! And this waterfall is just brilliant. I don’t think I would have ever been able to come up with something like this in a million years. It turned out amazing, though. I can’t wait to see all of the other things that you put into the fairy herb garden! Thank you, Amy. It is lovely to have a project that my daughter is just as excited about as me – we have lots of ideas so I think it’s going to take us a while to build it! This is an awesome fairy garden water falls. The stones are looking so good and surprisingly it is so cheap. Very creative and good work. What are the herbs in the garden, can I come and take few herbs for my blog to use in some of my recipes. Thank you Sadhna. We have planted so many lovely herbs. I will make sure I list them all at some point – you’d be very welcome to come and pick some and in return, you could teach me how to use them in one of your wonderful curries! Wow! You have been hard at work, it all looks so fantastic. Love the waterfall and herbs, can’t wait to see it grow. I’m also excited to see what herbs you’ve planted and how you use them, I’ve learned so much from you on this topic! Thanks, Nikki, we have so much more planned – it’s just finding time for the ‘doing’ aspect! You make these projects look so easy.